To publicize Gol Linhas Aéreas new service, the Pet OnBoard, B4Tcomm created an action with unusual influencers: 5 dogs who, together, have 658 thousand followers in Instagram. Always seeking to create networking among our clients, B4T added Petit Casa da Montanha, a pet friendly hotel in the city of Gramado. to the action. For 2 days, the 5 dogs were invited to test the services offered by the hotel. B4Tcomm action, creating the partnership, highlighted both clients’ services. Involving suppliers already familiar with both Gol Linhas Aéreas and Petit Casa da Montanha was critical to ensure the best results. on the invited dogs feeds. The project was a 2018 Jatobá Awards nominee, in the Social Media Actions category. 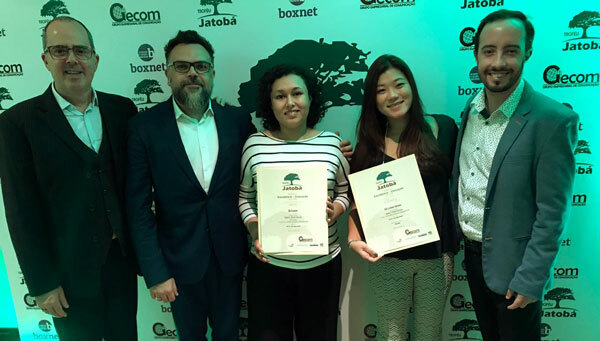 The B4Tcomm team and the clients were present at the ceremony.